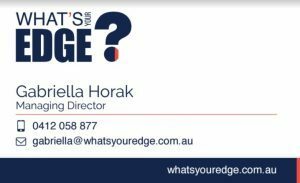 Big Issues Facing Leaders in 2019 - What’s Keeping Us Up at Night | What's Your Edge? Late last year KPMG published a white paper on the big issues facing business leaders. Here are some of the stand out points around workplace culture, senior leadership and boards. Dealing with issues in organisational culture from teams to management is my facilitation speciality. It’s something that deeply interests me and so I’m always keen to read and share any business analysis on the subject. This here, for example, is a review we did on a management practice guide published by Chartered Accountants Australia New Zealand, The Ethics Centre, Governance Institute of Australia and Institute of Internal Auditors – Australia. Here are a few points I thought were of particular interest from KPMG’s white paper ‘Keeping Us Up at Night’. KPMG’s White Paper ‘Keeping Us Up at Night’. In 2019, KPMG engaged C-level leaders from a diversity of industries (in public and private sector) and organisational size to share about the current issues they faced. 220 leaders responded and the result was the white paper ‘Keeping Us Up at Night’. 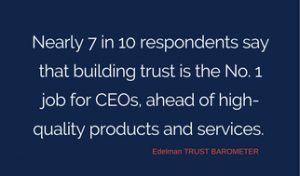 Not surprising, trust was one of the most outstanding issues for C-suite management as noted in the foreword by Alison Kitchen, Chairman KPMG Australia and Gary Wingrove, CEO KPMG Australia. “No longer some woolly discussion point, trust has burnt its way into the consciousness of senior leaders and is increasingly being recognised as the license to operate. As a result, organisations are asking themselves fundamental questions about their purpose, their mission, and how they present themselves to the world”. “Leaders have snapped hard to the fact that trust is not some amorphous discussion point, but rather a hard prerequisite for long-term success. Trust in capital markets drives the decisions of investors. Trust in the quality of a product and the integrity of a company informs consumer decisions. Trust in employers determines whether a talented staff member joins or remains. Trust and accountability make up a lot of the work we do at What’s Your Edge? because trust and accountability are essential elements for building successful individuals, teams and ultimately organisational Success Culture. But before working on trust we ensure that the mission, vision, values and underpinning behaviours and mindset are robust and meaningful. We’ve researched and written extensively on trust. If your team or organisation has trust issues please take a look at this article. It will help. An in-depth look at building organisational trust. I recently put it out there to my Linkedin community that I think in the very near future, we will see Boards and CEOs being held accountable for culture. Certainly, from my research, it looks like ASX, ASIC and ACCC will be doing just that. For now, however, the only way this is done is through Employee Engagement Surveys, which are subjective, and customer sentiment. And in my opinion, a once a year engagement survey doesn’t cut it! There is no way you can have a healthy culture lacking in connection and feedback or accountability – and it’s nearly impossible to create trust if you don’t put in other more regular measures*. This doesn’t outweigh the importance of implementing processes and IT infrastructure but effective communication top to bottom and bottom to top is absolutely critical to any organisation’s success. And that’s how you build trust. You may ask: Isn’t the CEO the Board’s representative? Well yes, but culture starts at the top and if you’re on the Board, you are at the very top and should be demonstrating actively what a Success Culture is. You need to know what’s really going on from your front line all the way up. Want to know how to create Success Culture? Watch this. Want to hear more about our M.A.G.I.C program? Email me if you would like to know more about our M.A.G.I.C. Program – designed for every employee to contribute to the profit, shareholder value and success of every organisation.